SHOP NOW FOR THE BEST SELECTION OF HOLIDAY GIFT SETS THANK YOU HHHHHHHH For Your Service! ENTIRE SELECTION DOVE, AXE & SUAVE Hair Care, Body Wash & Deodorants! 20 % OFF ©G&G Graphics and Promotions Inc. J10116A MCX Camp Lejeune, NC MCX Miramar, CA MCX Camp Pendleton, CA MCX Quantico, VA LIKE IT? CHARGE IT! GET CONNECTED! 2018-2019 PARTICIPATING EXCHANGES: MCX advertising is part of your benefits as a member of the US military family. To opt in or out of receiving mailings or emails, please contact us by going to www.mymcx.com/mailings. Please visit www.mymcx.com for additional information about MCX. OUR ADVERTISING POLICY Pricing, selection, and availability will vary by location. Unless otherwise specified, discount taken off regularly marked prices. To maximize stock available to our customers, we may limit purchase quantities. If an item is out of stock, we may substitute with a comparable item and we do not offer Rain checks. We are not responsible for typographical or photographic errors. Advertised items may not qualify for additional promotional discounts. Special catalog pricing effective November 7-13, 2018. 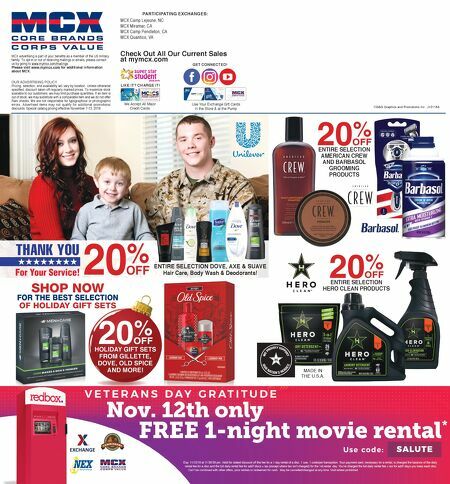 Check Out All Our Current Sales at mymcx.com Use Your Exchange Gift Cards in the Store & at the Pump We Accept All Major Credit Cards MADE IN THE U.S.A. 20 % OFF ENTIRE SELECTION AMERICAN CREW AND BARBASOL GROOMING PRODUCTS 20 % OFF ENTIRE SELECTION HERO CLEAN PRODUCTS 20 % OFF HOLIDAY GIFT SETS FROM GILLETTE, DOVE, OLD SPICE AND MORE!